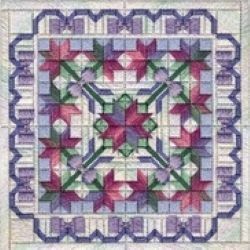 Design Area: 10.44" x 10.44" ~ Materials List: 14" x 14" 18 Ct Canvas Eggshell ~ 14" x 14" Stretcher Bars ~ Japanese Tacks ~ #22 Tapestry Needle ~ Caron Watercolours, 017 Blue Lavender(1), 206 Guacamole(2), 254 Porcelain Blue(1) ~ DMC #5 Perle, 367 Dark Pistachio Green(1), 712 Cream(1) ~ Rainbow Gallery, Nordic Gold ND10 Purple(1), Overture V119 Bouquet(2), Silk Lame' Braid #18 SL14 Blue(4). # in () indicates number of skeins or cards needed. 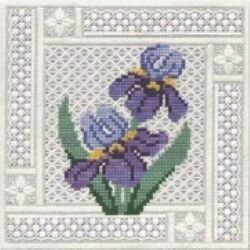 Design Area: 5.78" x 5.78" ~ Materials List: 10" x 10" 18 Ct Canvas Eggshell ~ 10" x 10" Stretcher Bars ~ Japanese Tacks ~ #22 Tapestry Needle ~ Caron Snow, 19 Icy Lavender(1), Caron Watercolours, 028 Confetti(1), 134 Dawn (uses almost all of 1 skein) ~ DMC #5 Perle, 501 Dark Blue Green(1), 966 Medium Baby Green(1) ~ Rainbow Gallery Petite Sparkle Rays, PS43 Dark Lavender(1), Silk Lame' Braid #18 SL22 Lavender(2). # in () indicates number of skeins or cards needed. 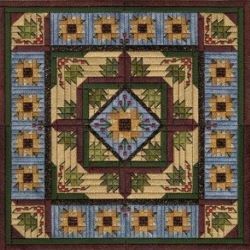 Design Area: 8.44" x 8.44" ~ Materials List: 12" x 12" 18Ct Zweigart Brown or Sandstone Canvas ~ 12" x 12" Stretcher Bars ~ Japanese Tacks ~ #22 Tapestry Needle ~ Caron Snow, 23 Chocolate(4), Caron Watercolours, 122 Maple(2), 189 Gingersnap(2), 287 Seaweed(1), 290 Mystery Mix(1). #in () indicates number of skeins or cards needed. 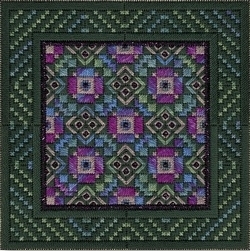 Design Area: 9" x 9" ~ Materials List: 14" x 14" 18 Ct Canvas White ~ 14" x 14" Stretcher Bars ~ Japanese Tacks ~ #22 Tapestry Needle ~ Caron Watercolours, 017 Blue Lavender(1), 121 Evergreen(1), 134 Dawn(2), 209 Iris(1) ~ DMC #5 Perle, 550 Very Dark Violet(1), 792 Dark Cornflower Blue(1), 895 Very Dark Hunter Green(1) ~ Rainbow Gallery, Cresta d'Oro C25 Violet(1), Fuzzy Stuff FZ23 Gold(1), Gold Rush 14 210C White Pearl(4) OR Gold Rush 18 GD10C White Pearl(4). # in () indicates number of skeins or cards needed. 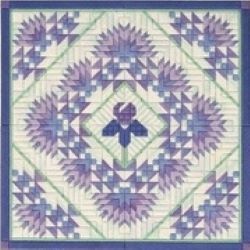 Design Area: 9.22" x 9.22" ~ Materials List: 14" x 14" 18 Ct Canvas, Sandstone ~ 14" x 14" Stretcher Bars ~ Japanese Tacks ~ #22 Tapestry Needle ~ Caron Snow, 14 Mango(1), Caron Watercolours, 255 Cornflower Blue(2), 278 Chianti(2), 287 Seaweed(1) ~ DMC #5 Perle Cotton, 355 Dark Terra Cotta(1), 435 Very Light Brown(1), 437 Light Tan(1), 934 Black Avocado Green(2) ~ Rainbow Gallery Gold Rush 18, GD109C Bronze(3 cards). # in () indicates the number of skeins or cards needed. 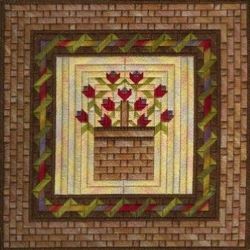 Design Area: 10.67" x 10.67" ~ Materials List: 15" x 15" 18 Ct Canvas, Sandstone ~ 15" x 15" Stretcher Bars ~ Japanese Tacks ~ #22 Tapestry Needle ~ Caron Collection Watercolours, 028 Confetti(1), 083 Pine Forest(2), 121 Evergreen(2), 169 Moss(2), 190 Fraises du Bois(1) ~ DMC #5 Perle, 644 Medium Beige Gray(2), 822 Light Beige Gray(1). # in () indicates number of skeins or cards needed. 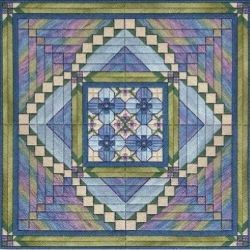 Design Area: 8.33" x 8.33" ~ Materials List: 12" x 12" 18Ct Zweigart Sandstone Canvas ~ 12" x 12" Stretcher Bars ~ Japanese Tacks ~ #20 and #22 Tapestry Needles ~ Caron Watercolours, 017 Blue Lavender(1), 066 Jade(1), 067 Celadon(1), 270 Easter Egg(1) ~ DMC #5 Perle Cotton, 341 Light Blue Violet(1) ~ DMC Color Variations #5 Perle Cotton, 4240 Mid-Summer Night(2) ~ Rainbow Gallery Gold Rush 14 Variegated, 216C Lavender Mix(3). #in () indicates number of skeins or cards needed. 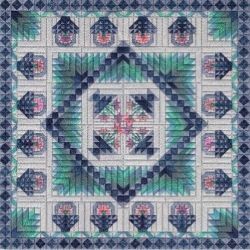 Design Area: 8.9" x 8.9" ~ Materials List: 13" x 13" 18 Ct Canvas, Sandstone ~ 13" x 13" Stretcher Bars ~ Japanese Tacks ~ #22 Tapestry Needle ~ Caron Collection Snow, 25 Brass(1), Caron Collection Watercolours, 051 Abalone(1 uses almost all), 264 Oyster (2), 300 Belgian Stone(1) ~ DMC #5 Perle, 315 Medium Dark Antique Mauve (1), 820 Very Dark Royal Blue(2), 902 Very Dark Garnet(1), 3041 Medium Antique Violet(1). # in () indicates number of skeins, spools or cards needed. 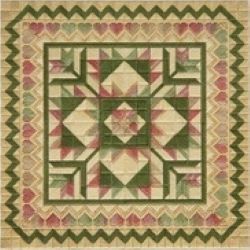 Design Area: 8.67" x 8.67" ~ Materials List: 14" x 14" 18 Ct Canvas, Eggshell ~ 14" x 14" Stretcher Bars ~ Japanese Tacks ~ #22 Tapestry Needle ~ Caron Watercolours, 035 Raspberry Sherbet(1) ~ DMC #5 Perle, 738 Light Tan(2), 739 Very Light Tan(2), 3051 Dark Gray Green(2) ~ Rainbow Gallery, Treasure Chest TC03 Gold(1). # in () indicates number of skeins or cards needed. 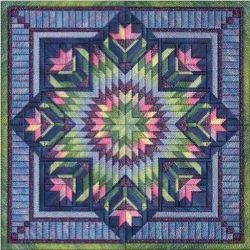 Design Area: 9.78" x 9.78" ~ Materials List: 14" x 14" 18 Ct Canvas, Eggshell ~ 14" x 14" Stretcher Bars ~ Japanese Tacks ~ #22 Tapestry Needle ~ Caron Watercolours, 134 Dawn(3), 209 Iris(2) ~ DMC #5 Perle, 208 Very Dark Lavender(1), 210 Medium Lavender(1), 333 Very Dark Blue Violet(2), 340 Medium Blue Violet(1), 966 Medium Baby Green(1) ~ Rainbow Gallery, Cresta d'Oro C25 Violet(1). # in () indicates number of skeins or cards needed. 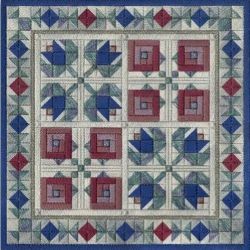 Design Area: 9.33" x 9.33" ~ Materials List: 14" x 14" 18 Ct Canvas Eggshell ~ 14" x 14" Stretcher Bars ~ Japanese Tacks ~ #22 Tapestry Needle ~ Caron Watercolours, 089 Caribbean(1), 160 Night Sky(2), 190 Fraises du Bois(1), 197 Monsoon(1), 255 Cornflower(2) ~ DMC #5 Perle, 762 Very Light Pearl Gray(3) ~ DMC #5 Color Variations, 4030 Monet's Garden(1). # in () indicates number of skeins or cards needed. 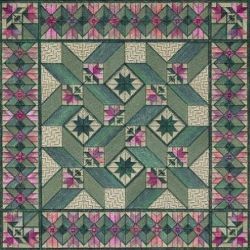 Design Area: 6.23" x 6.23" ~ Materials List: 10" x 10" 18 Ct Canvas Sandstone ~ 10" x 10" Stretcher Bars ~ Japanese Tacks ~ #22 Tapestry Needle ~ Caron Collection Watercolours, 236 Appalachia(2), Caron Collection Snow, 15 Mauve(1) ~ Rainbow Gallery Gold Rush 14 WG85C(1) ~ DMC #5 Perle, 500 Dark Green(2). # in () indicates number of skeins or cards needed.